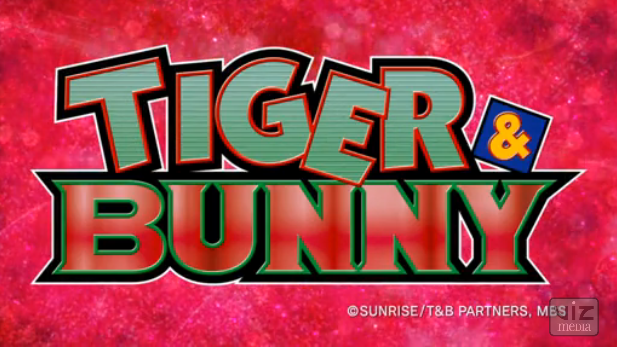 Today, we introduce Tiger & Bunny, a straight-to-TV series from Sunrise and Bandai Visual. The urban sprawl known as Sternbild City may be no Gotham or Metropolis, but it certainly does have its share of heroes. Thanks to a genetic occurrence known as "NEXT", average citizens have the capability to obtain untold powers, but the league of superheroes is more NASCAR than Justice. In fact, the networks have capitalized on the glut of heroes for the sake of the almighty Stern dollar, creating "Hero TV", a live game show that combines the real time competition of a Smash TV with the hokeyness of the "Big Shot" TV show that appeared on Cowboy Bebop. 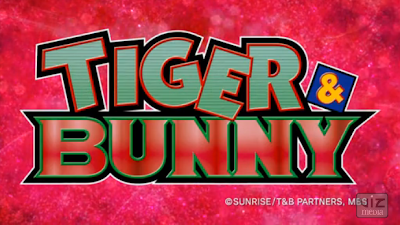 Tiger & Bunny covers the lives (and corporate sponsorships) of the heroes involved in this sports-entertainment show. For Kotetsu, a veteran hero known as "Wild Tiger" who can increase his bodily strength for five minutes at a time, he needs the money to give a life to his daughter, but success is a demanding league and popularity is hard to come by. The last straw appears to be the sale of his sponsor, forcing Kotetsu to swallow his pride and join a new sponsor. It just so happens, however, that his new boss hasn't employed only Kotetsu for his services. Actually, Kotetsu now has to work alongside Hero TV's newest rookie Barnaby Brooks Jr., an unmasked hero who has the exact same powers as Kotetsu. 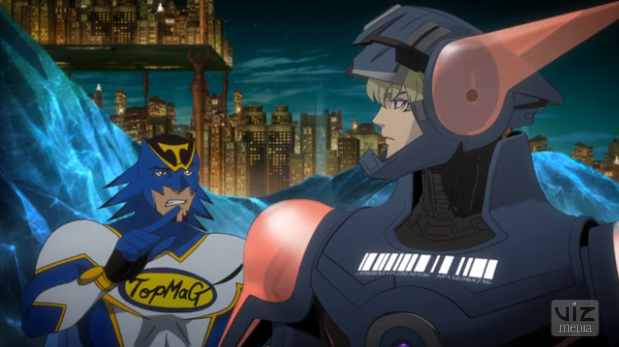 The whole concept of scored competition on Tiger & Bunny opens up an entire new dimension to the superhero anime. Rivalry between heroes is likely nothing new, but to make an entire federation surrounding it brings a unique spin upon it all. By turning superheroes into reality TV stars, we not only get a whole string of action scenes, but we also get Kotetsu's background and personal life, which gives the show added depth. Sunrise and Bandai Visual have combined their forces for this futuristic show, so we get a good mix of CGI and traditional animation. I've always been a bit skeptical of the two forms working together, especially in the same frame, but Tiger & Bunny forms a cohesive unit. In a certain way, it almost feels like a competition between both media, much in the same way Kotetsu's superhero tights must compete against the Iron Men of Hero TV, but they cooperate enough to gel. The character designs are also mighty, capitalizing on different elements to make a range of competitors. There's no doubt that the characters will direct the pace of this show. Each of the superheroes has a small quirk in personality or ability to go with their status on the show, whether we see it on the air or during the celebratory dinners. You have your list of boneheaded heroes, egoists and credit stealers, but teaming up a hero without a schtick or identity (Barnaby) with a hero whose schtick and identity are all he has left (Kotetsu) is a shrewd move by the show's producers. Most of all, how can you not like the down-on-his-luck Kotetsu? He abides by the codes of justice and wants to be recognized by kids, only to be reminded that he's the card in the collector's pack that no one wants to keep. By teaming him up with Barnaby, who appears to be the kind of hero that thinks outside the phone booth, we might get some sort of Lethal Weapon partnership (without Leo Getz). It's pretty obvious that the selling points for Tiger & Bunny are the characters and animation, but the soundtrack isn't all that bad. Peppy rock transitions into dramatic background music, and we even get some cuts from Blue Rose, the "idol singer" of the competition. The acting is decent with some good spots from Kotetsu (Hiroaki Hirata) and Agnes, the network's demanding producer (Yûko Kaida). Tiger & Bunny flew under the radar as the spring season neared, the hype machines turned off to let the show work off the reputation of its animation studios. No manga or video game to go by, Sunrise and Bandai pretty much had the freedom to produce a solid show from scratch, but that also left the show without much marketing surrounding it. That was probably the best thing going for it, as we didn't know enough about the show to avoid it. Considering this is Keiichi Satô's first work as director, this show looks solid for a novice so far. 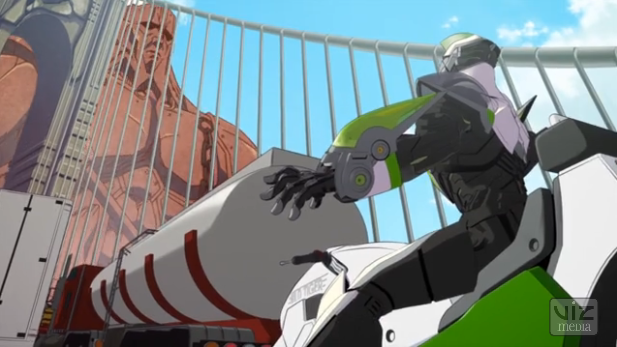 Tiger & Bunny is using a formula that Marvel's Iron Man anime had inverted last year. Instead of taking a drama and forcing comedy into it with a metaphorical sledgehammer, the comedy here is the main source of entertainment with the action scattered amongst the plot. We get the sense that the show is a distinct parody of everything television has become nowadays, from product placement to narrow-minded approaches towards ratings, and that's bound to make the show incredibly popular in both the U.S. and Japan. The only questionable aspect is the untested dynamic between Kotetsu and Barnaby. There doesn't appear to be the clash of bravado between heroes forced to cooperate, and that might make entrench the show in too much philosophy. Of course, all of the other heroes just might dispel that dynamic enough to make the show a fun mishmash of hijinks. 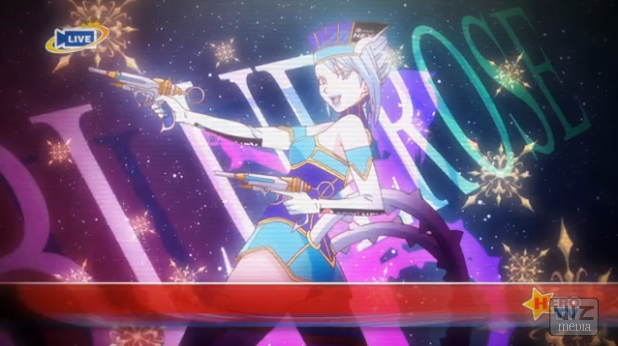 Tiger & Bunny's already a hit with me! Okay, now where's my endorsement deal, Mr. Producer?